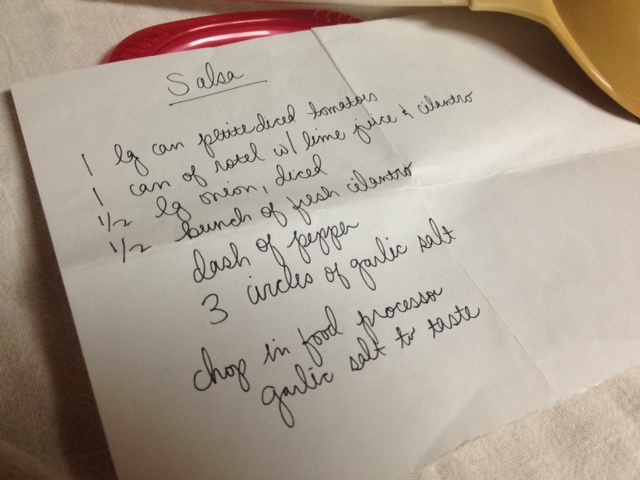 My family LOVES salsa. 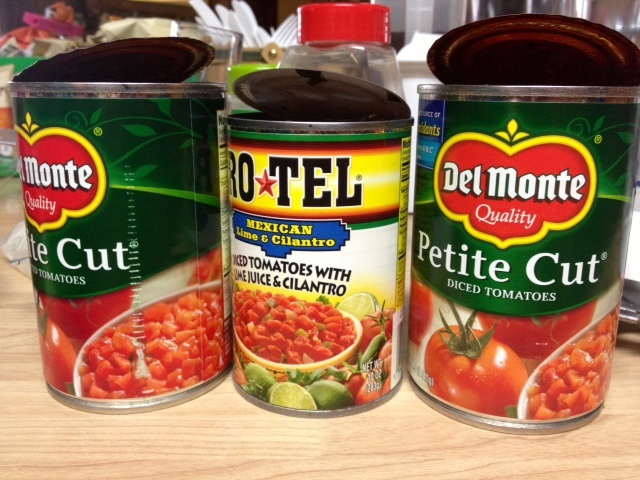 Well…I should say that my dad and sisters LOVE salsa. My mom and I? Meh. Largely because we’re babies and find it too spicy. 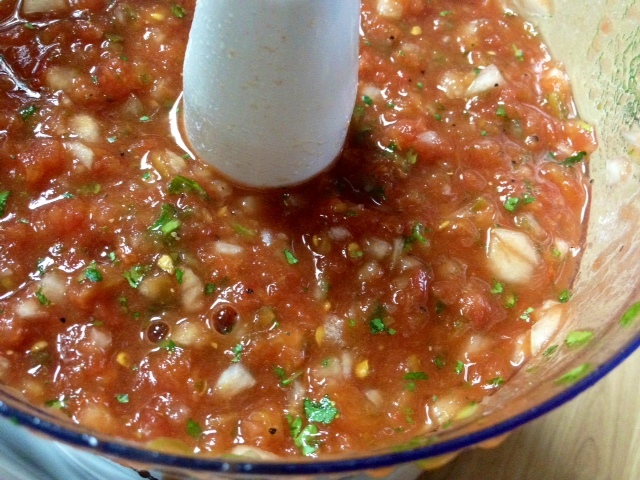 The thing is, I really WANT to love salsa. It looks so good! It has tomatoes! You eat it with chips! All of these things indicate I should love it, but somehow I dip the corner of my chip in it, shake it off, and call it good. 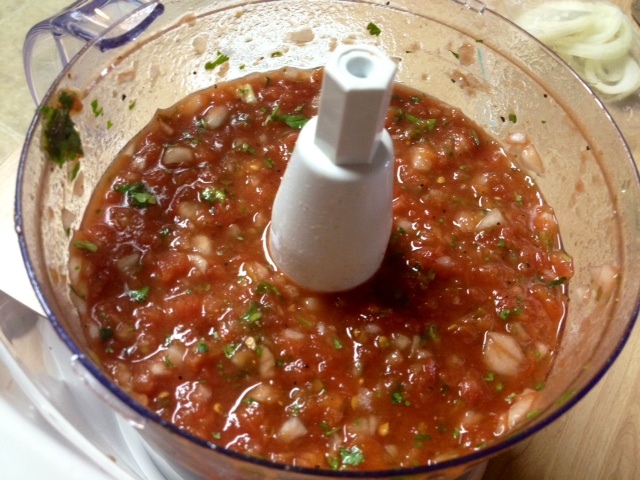 However, the crowds go wild for this salsa. Seriously, it’s crazy. I was back in Kansas visiting my family last month for various graduations, and my mom made a big batch to take to my cousin Janelle’s party. We got there, set it out on the counter next to another big Tupperware container of salsa, started going through the line. And in LITERALLY FIVE MINUTES it had been totally devoured. I’ve never seen anything like it. 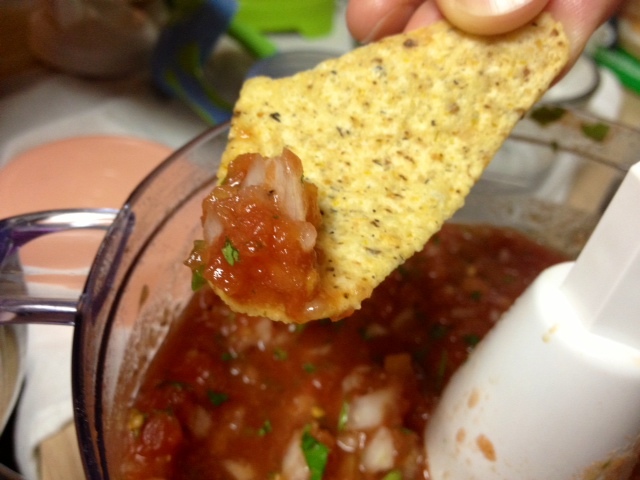 So rest assured, this is not just me saying it’s the best salsa, it’s a whole bunch of salsa-crazed outsiders. It’s also the easiest thing in the world, and takes ingredients you can very easily acquire—including one secret ingredient. That’s right, Rotel with lime juice and cilantro. Why? No idea. 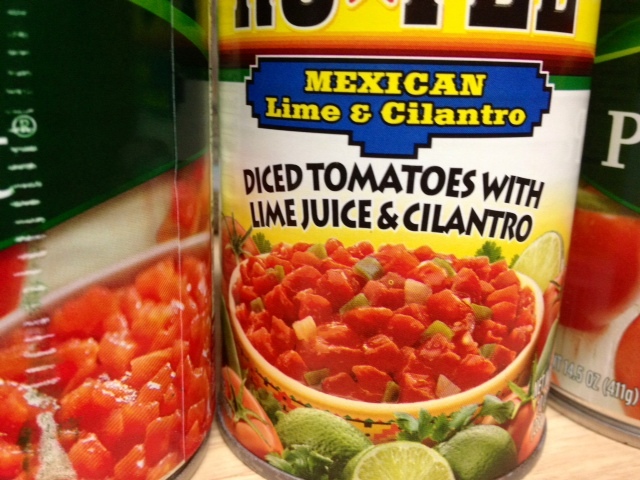 But seriously, it’s the secret ingredient and without it your salsa will be only adequate, not spectacular. You will ignore me and decide any old Rotel will do the trick. And then you will cry because your salsa isn’t as good. 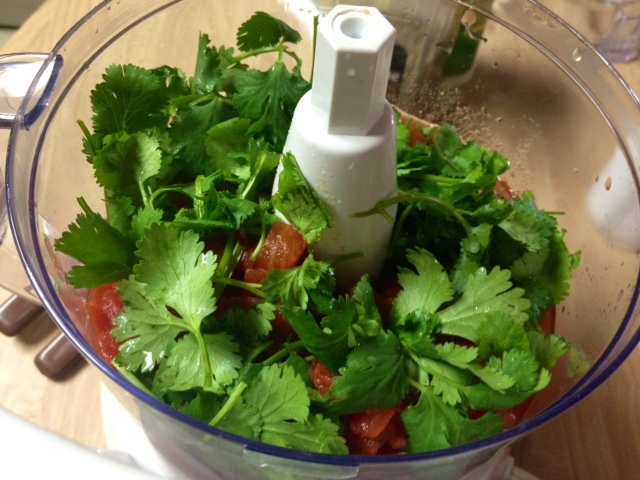 Trust me on this one, and get the Rotel with lime juice and cilantro. 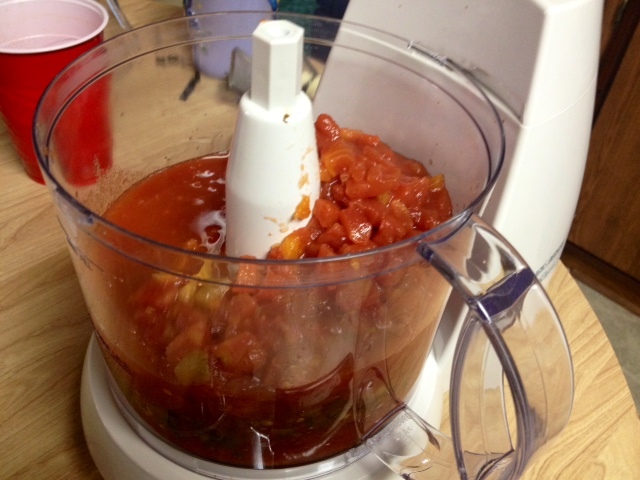 Dump the tomatoes and Rotel into a large food processor. 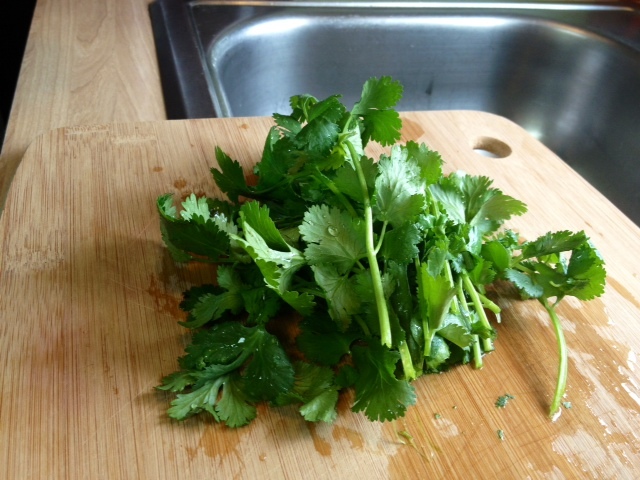 Strip the cilantro from the stems and add to the processor. 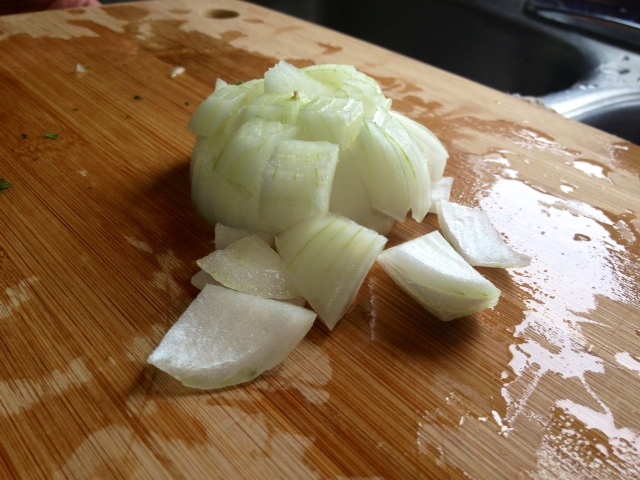 Throw in your diced onions. 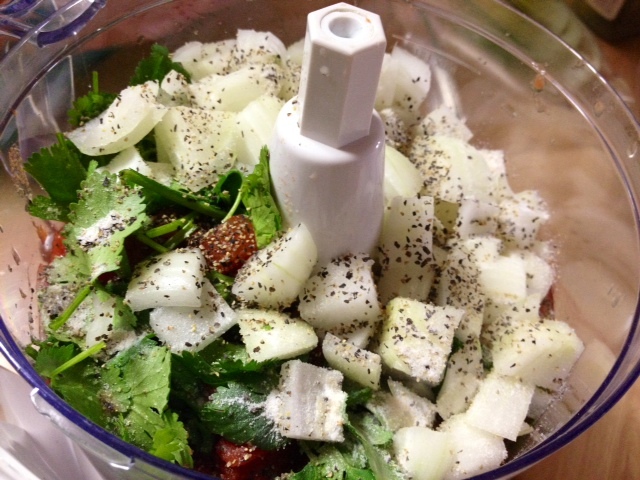 And lastly, throw in some pepper and about three circles of garlic salt. “Circles” as in you heavily sprinkle the garlic salt in a circle three times. Don’t pretend that’s not a real measurement. Fire that baby up, and blend or pulse until it reaches the consistency you want. Some people want theirs really watery and smooth like some Mexican restaurants have it, but that’s always weirded me out. 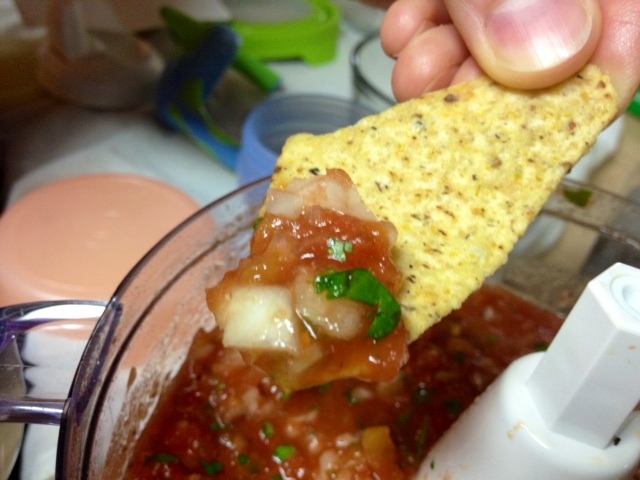 I like some chunks in my salsa. But to each his own. You can also adjust the seasoning to your particular tastes. 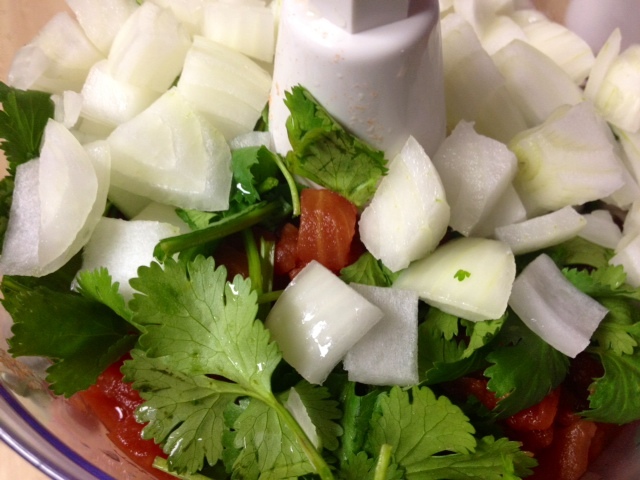 Pour the tomatoes into a large food processor, followed by the cilantro, diced onion, pepper, and garlic salt. Blend until it’s the appropriate amount of chunkiness for your particular taste. Chill if desired (I prefer it). « Travel Postcard: Las Vegas!